You might have heard already of Caramoan Islands. It has been chosen as the location for many “Survivor” TV shows worldwide. And it was chosen for a reason – being a secluded tropical paradise. Getting here is complicated, so book your Caramoan tour with our experts to avoid hassle and complications. Come and visit this island for one of the best island hopping experiences, and wonderful private beach resorts. You can do that as a day trip from Bicol or as part of a longer vacation package. Getting to Caramoan is not as easy as it is to get to other destination in the Philippines. The reason is that it hasn’t been commercialized yet. There are several routes to get from Manila to Caramoan. You can either take a night bus from Araneta-Cubao bus terminal, or Pasay City bus terminal heading to Naga City. It is an 8-9 hours trip and cost 650-1000P (13-20$). You can choose to get to Caramoan from Naga, you will need to choose between two routes, by land or by sea. To get there by land, take a bus from Naga City Bus Terminal, also known as Bicol Central Bus Terminal heading to Caramoan. MRR, Raymond and Florencia Bus companies have buses that leaves as early as 6:30 AM, and the trip is 4 hours long. The more popular route however, which is shorter by boat from Sabang Port. The east bound van terminal at the back of SM City Naga Mall has vans departing to Sabang Port from 6:00 AM. Travel time is 1-1.5 hours. From Sabang Port take a boat to Guijalo Port in Caramoan, about 1.5 hours. From there a short tricycle ride will bring you to the town proper. Getting to Caramoan by airplane is a lot easier and much more convenient. There are daily flights to Naga from Manila and Cebu. Be sure to be in Naga early enough so you can catch the last boat to go to Guijalo port from Sabang at 11:00 AM. If you are not coming from Manila fly into Naga and follow the instructions above. The shortest way however is to in Catanduanes, and hire a tricycle to take you to Codon Port. From there hire a boat to take you to Caramoan Islands. The trip all over should take you around 3 hours, but flights to Virac are far more expensive and less frequent from flights to Naga. If you book with us we can coordinate an airport pickup from Naga to your resort, and for larger groups we can hire a van from Manila directly into Caramoan. Contact us for understanding the best way for you. When visiting a unique place like Caramoan, you want your accommodation to be as special as possible. It’s of course a matter of budget, but every hotel and resort on our catalog has been carefully handpicked to ensure you’ll get the best value for what you pay. Caramoan hasn’t been commercialized yet, and that’s a good thing, because its beauty is still raw and untouched. On the other hand, the selection is limited. Most of the resorts are basic, but there are some high-end all inclusive resorts that will give you the best accommodation experience you can hope for. It’s better to book ahead because these resorts get fully booked quickly, especially during christian holidays when locals go on vacation. Most of the budget and mid range accommodation is in the town itself. Although they are not beachfront, they offer good value for money. All of them are within walking distance from the town’s attractions, and a short ride from Paniman Beach and other gateways for island hopping tours. Choose a resort from our list depending on your needs and budget. If you are still not sure contact us, and we will understand together what’s best for you. What to do in Caramoan Islands? Caramoan’s main attraction is island hopping. The islands and beaches are literally untouched, and among the top island hopping experiences the Philippines has to offer. Besides of beach bumming on beautiful beaches, there are many mainland attraction to make your stay here unforgettable. The boats taking you island hopping in the Caramoan Islands are waiting in Bikal Boat Terminal or Paniman Beach. There are several tours you can chose from, and it’s usually determined by the distance from the mainland. The rate for the tour to the closer islands is 1500P (30$) and the far islands tour rate is 2500P (50$). The boat is good for 6 people. You can pre-book the tours through us or do it when there. If you are alone or travel as a couple, and want to save money, you can also look around for other tourists who might join you and share the fare. The islands close to shore include: Matukad, Lahos and Hunongan Cove. Matukad Island is very unique and used to be the place for the council meetings of the “Survivor” series. Tayak Lagoon is its main attraction, with its clear turquoise water bountiful with giant milkfish. A very popular activity on this island is climbing the rock cliffs to get a great view of both the lagoon, and surrounding islands. Lahos Island on high tide are two separate rock formations facing each other, but on low tide a white strip of white sand will rise from the water and connect the two cliffs. This is actually one of the popular spots for the “survivor” challenges to take place. Hunongan Cove has a beautiful white beach cradled by the towering cliffs, and is owned by a private luxury resort. As a result, stopping here will cost an additional 300P (6$) and you’ll be able to use the resorts facilities. Unless you are really keen to explore some of the structures used by the “Survisor” cast, feel free to skip this one. The short trip also stops at Cagbalinad and Minalahos, two small islands that offer decent swimming, but are most notable for the scenic views of the nearby islands. You’ll get a great view of Gota Beach with its heavily forested hills and limestone cliffs. The long island hopping tour includes: Manlawi sandbar; Cotivas Island; Sabitang Laya and Bagieng beach. Manlawi is a beach with a huge sandbar visible only on low tide. If that happens to be during lunchtime, it will make a perfect spot to take you lunch in. there are even cottages for renting, for 100-200P you can rest and eat there. Cotivas island is one of the most beautiful islands in Caramoan. It is one of the most popular spots of the “Survivor” set, and if you’ll visit there on low tide you’ll see endless sandbars stretching in front of your eyes. It also has two beaches perfect for swimming and tanning. Sabitang Laya and Bagieng Beach are both located on Bagieng Island. Both are beautiful, and usually Sabitang Laya is the first stop on the long trip, and Bagieng Beach is the last. The first has crystal clear water, and surrounding limestone cliffs that make a scenic atmosphere. There are stinging jellyfish in the waters at times, but it’s a very nice stop nonetheless. Bagieng Beach is a long white sand beach with some coconut trees and green on it. 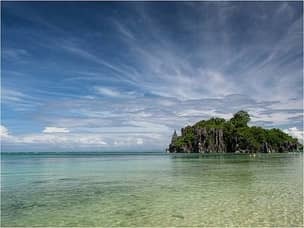 Outside of the regular tour there is Lahuy Island, the biggest island in Caramoan. It’s the island where Manlawi Sandbar is located, and you can also trek to its lighthouse (around 1 hour) for an amazing view of the ocean and the surrounding islands. Literally every island on the tours will be stunning as Caramoan is one of the top spots in the Philippines for island hopping and raw nature. 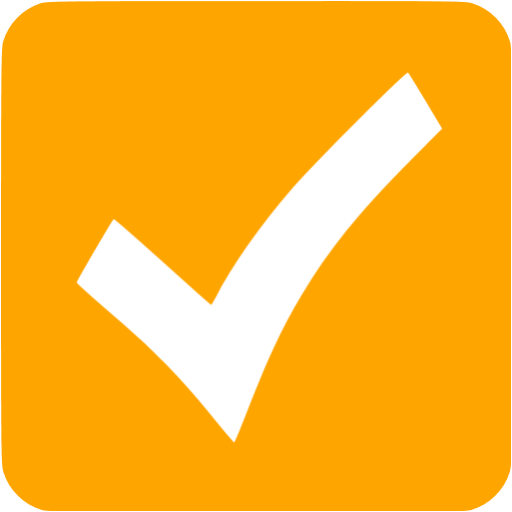 If you are staying for a couple of nights, taking both tours, to the nearby and far islands, is strongly advised. Moreover, it is possible to construct a personalized tour, and even to camp overnight on some of these islands. the local market, and the mangrove area. The Parish Church of St. Michael the Archangel, a red brick building built in 1619 is the town’s main landmark. There are also many caves you can explore. You’ll find Umang Cave in Barangay Paniman, and it showcases amazing stalactite formations. Bulang-Bugang Cave is accessible from near Bulang-Bugang Underground River, close to Oroc-Osoc elementary school in town. It’s a small tunnel in the bottom of a tall limestone formation, in which water pass through, and only one person can pass at a time. Culapnit cave is in Barangay Tabgon which is a bit of a drive away. it’s a bat cave with many stalactite formations in it. 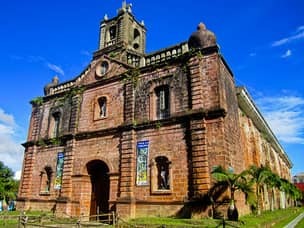 Another place to visit, also in Barangay Tagbon, is Our Lady of the Most Holly Shrine. It’s a 26 ft. Marian statue reachable after a 524 steps climb, where you’ll also get a great view of the quiet fishing town at the bottom. In the neighboring Patag Belen and Hanopol Barangays there are two waterfalls hiding, Hugsad falls and Layahan Falls. Still unknown to tourists, and the hikes are moderately difficult and take around 2 hours each. In our opinion, Hugsad falls are those who truly worth the visit compared to the difficulty of getting there. Is Caramoan Island the right place for you? As you’ve already seen on TV Caramoan is breathtaking, but your’e probably wondering how fitting it is for a vacation, and whether there are other places in the Philippines that provide a similar experience. Those are very subjective and personal questions, but in the table below we’ll compare Caramoan to the most other popular destinations. This will hopefully help you make up your mind and understand if Caramoan is the right vacation spot. This price includes: Airfare, Accommodation, Tours and Living costs. There are both budget and high end options in Caramoan, but it’s hardly the cheapest place in the Philippines. In El Nido budget accommodation is generally better, and much closer to the ocean. Also, getting to Caramoan is far more complicated than both Boracay and El Nido. The views here are outstanding, but the same is true for the other two as well. Caramoan’s most significant advantage is that even during high season it’s less crowded and you can feel a kind of “castaway” atmosphere. El Nido and Boracay are by far the two most desired places in the Philippines, and are very different from one another. While El Nido more resembles Caramoan, Boracay is very much different. It offers a tourism oriented vacation, where everything want is easily accessible. Diving, snorkeling, water sports, nightlife, shopping – it’s all there. It’s very easy to get there, and resorts are all very modern. For these reasons it’s also more crowded and expensive. If you feel like having a pampering holiday, Boracay is more suitable to your desires. El Nido resembles Caramoan in terms of the lifestyle, island hopping, and overall atmosphere. Because El Nido became one of the most visited destinations in the Philippines, it can also feel a bit crowded at times. Nonetheless, it’s big enough to host everyone and still maintain quiet and secluded spots. Diving in El Nido is considered among the top in the Philippines. El Nido also has a much wider selection of hotels and resorts of any price range. That being said, El Nido requires a longer period of time to enjoy properly, so if you plan on a short stay Caramoan will be better. If your’e looking for a simple atmosphere, the way El Nido used to be before the crowds came in, give Caramoan a try. You can try one of our pre made vacation packages, or let our experts build a custom itinerary just for you, where you can add Caramoan as well as other destinations that suit your personal style. How does Caramoan fit into your travel plan? Caramoan is best enjoyed over a couple of days. If you are already in Bicol, you can make it as an Island hopping daytrip, but even then you will feel like you are rushing it. it will also be more expensive because the last boats back to Sabang are at 2:00 PM, which means you’ll have have to rend a private tour. This place is packed with attractions for you to choose from, and you can easily see most of what it has to offer in 2-3 days, so take a while to properly enjoy this paradise. You can do it either as a stop in your Bicol tour package, or as an independent tour package complimentary to your full Philippines vacation.